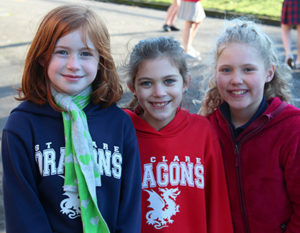 St. Clare is a Catholic, parish-school community, rooted in Gospel values and dedicated to the spiritual and educational development of the whole child. To teach as Jesus taught is the foundation on which the Catholic identity of St. Clare School is based. We strive to be a community of faith, love, inclusion, and respect for creation, others, and self, where our children learn about God by what is taught and by example. We nurture our children’s relationship with God through opportunities for liturgy, prayer, celebration, and the expression of Gospel values through community service. We collaborate with parents, the primary educators of our children, to ensure that thoroughness of instruction and respect for each child encourages the spiritual, intellectual, physical, and emotional development of the child. We challenge our children to use their abilities to achieve academic excellence, to be lifelong learners, and to embrace their futures with hope.